Auction #1028 Lots Posted. Browse & Bid Now! Our Sunday Internet Auction #1028 offers a fantastic selection of 250 New Items, along with 50 Special No Reserve lots and 25 Vault Value items. Also featured in this week's sale is Part 1 of the Creole Collection. The Creole Collection is a fascinating 29-coin assortment of coins across the realm of U.S. numismatics with a focus on several high-end Branch Mint Gold coins. Included in this offering is a historically important 1861-D G$1 PCGS MS60, a lovely 1839-D 2 1/2 PCGS CAC MS62, and a scarce & desirable 1842-D 2 1/2 NGC/CAC AU55. These and other pedigreed and colorful examples make the Creole Collection a must see. View and bid before Auction #1028 closing on Sunday, September 2nd. Our first highlight is an 1839-D 2 1/2 PCGS/CAC MS62. A lovely example of this unusually well-struck Dahlonega issue with crisp surfaces and nice remaining luster. This coin has a satiny look with a light rose-gold patina, this first year of issue for the Dahlonega mint is very popular amongst Southern gold collectors. This week's second highlight is an 1861-D G$1 PCGS MS60. For a variety of reasons, the 1861-D is considered to be the most important and desirable gold coin produced at the Dahlonega mint. It is the single rarest collectible gold dollar, and it is the only issue conclusively produced entirely by the Confederacy. 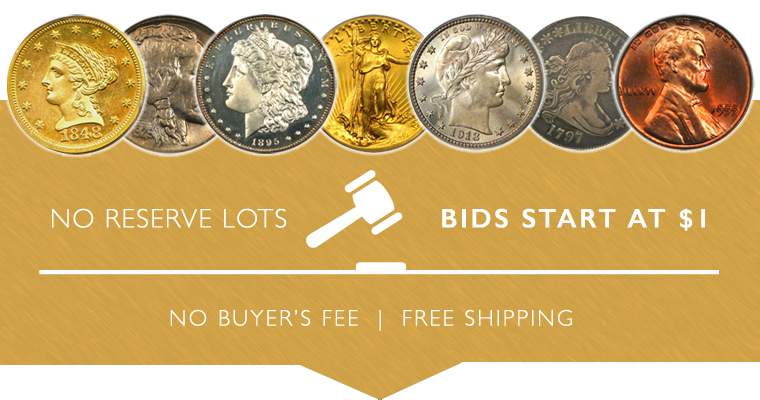 It is an issue with multiple levels of demand, and it has been coveted by collectors long before there was an established rare date gold market. An estimated 65-75 are known in total, with around a dozen or so having claims to Uncirculated status. Some of these higher graded coins have been processed and are no longer original as a result. Many others are off the market in tightly held collections. Our final highlight is an 1892-O 50c PCGS/CAC MS64 (Micro O). Barber half collectors know that the Micro O is the rarest widely-collected issue in the series. There are only a few dozen known in all grades and even low grade examples are really scarce and shouldn't be passed up. Of course there are many other highlights, so be sure to browse all lots in this exciting new sale before it closes on Sunday, September 2nd.